Mill-Max is pleased to announce the addition of three new large scale, high current spring pins to our expanding family of ruggedized spring-loaded products. In contrast to our miniature spring pins, which are typically used on .100" (2,54 mm) centers, these new offerings are for applications where greater spacing is required due to electrical and mechanical specifications. All three are rugged spring pins, rated at 9 amps and designed with unique termination features. The 0854-0-15-20-82-14-11-0 has a solder cup while 0855-0-15-20-82-14-11-0 is designed with a crimp barrel - both can accept wire diameters up to 16AWG. The 0856-0-15-20-82-14-11-0 has a solder tail for PCB mount assembly. Inside each spring-loaded contact is a gold-plated, stainless steel spring rated for 1,000,000 cycles. 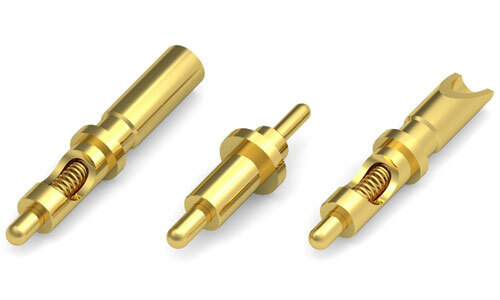 Gold plating provides the highest interconnect reliability, corrosion protection and wear resistance. MM large scale spring pins have a .045" (1,143 mm) working travel (.090" [2,286 mm] maximum travel) and exhibit higher spring forces than smaller miniature spring pin connectors. In addition, these spring-loaded pogo pins feature thick wall construction and solid plungers for increased durability. Mill-Max large scale spring pins are typically used in cable, front panel, board stacking and docking station applications.